Easy to install, do-it-yourself pet door for your wall. Telescoping tunnel to accommodate 4-3/4" to 7-1/4" thick walls. Place it anywhere you have a clear inside and outside wall area, from the garage, kitchen, mudroom, anywhere! Double flap construction with adjustable sill and extra strong magnets ensures excellent insulation factor. Durable aluminum frame. Includes a non-rusting locking closing panel. The PetSafe Wall Dog Door gives your Dog the freedom he deserves. The Wall Pet Door is designed especially for Wall Installation and is what you have been looking for! The Dual Flap design (one inside and one outside) makes for a well insulated barrier between the outdoors and your indoor room. This Dog Door can be used in a variety of wall materials including all types of siding, stucco, even brick. Installation requires only a few tools. The Wall Pet Door from PetSafe has a lifetime limited warranty. 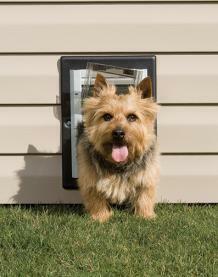 Easy to install, do-it-yourself dog door for your wall - Inside or Outside!